Now you can see who is following who from any profile page! You can now see who you're following and who has followed you. In fact, you can do this on any user's profile page to see who they are following and who their followers are too! All you need to do is visit anyones profile page and click the one of the numbers under the account name. Each link goes to the corresponding page with information on that group of users. From there, you can visit their profile, unfollow them, follow them, or even mute them. Thanks to both valzav and jcalfee for their respective help with this! I hope to be helping out more and more as time goes by, but I'm still learning the ropes for the ecosystem they've helped create. Since I'm unsure if the other details in this update will be published anywhere, I went through the commit log and have pulled out some additional details of whats changed. If any of these developers write up posts to their work, let me know and I'll update this post to their posts. Check out the update by @someguy123, who added a new feature for witness pages making it easier to vote for anyone! @roelandp's steemtools.com has been added to the sidebar menu to help users discover 3rd party tools. @roadscape added a temporary solution regarding the comment anchors, as reportd by @ash. A 200px offset anchor point has been added to account for the elements on the page showing and hiding. valzav and @jesta worked on adding a vote weigth slider that's visible for very large SP holding accounts. This will give them the option to choose how heavily weighted their vote is each time they vote. @roadscape reworded "Pending Payout" to "Potential Payout". An effort to help educate users that the payout value is continually adjusting over time and what you see now may not be the payout a post receives. valzav made sure the "Follow" button will now appear on top of all user profile pages, not just the blog tab. jcalfee has fixed some of the bugs with the login form. Hopefully it will behave in a more consistent manor now while users are attempting to login. @roadscape added a new filter called "Trending (30 day)", which will show posts that are trending during the 2nd payout window. jcalfee changed the display logic for images to also hide on low rating posts. @roadscape added a number of mobile/small screen optimizations for user tabs, the menu, and the topic selector. jcalfee improved the wording on the "Convert to STEEM" window to help avoid confusion for users. @roadscape made a change to author links, allowing once more the ability to open new tabs. Middle clickers rejoice! Note: If these kinds of updates are something the community wants, I'm more than happy to continue following the code and reporting on the changes. Love your work @jesta. YOU are the hero this site needs, not shameless narcissists constantly releasing the same content redone with different titles and benefiting off of users liking posts they know will have high payouts. I've been waiting for this. Great! But I'd like it too! I'm just happy to see the updates rolling in. The devs, and even you as mr. pull-request every-now-and-then are doing a stellar job. Great to see. Why thank you. It takes a village! Thank you for your contribution. Do you know when we will be able to upload avatar ? I don't have any insights into that. I should probably ask, maybe it's something I can help with. I think if we can all upload a pic instead of default avatar it would create a cooler, warmer atmosphere if you know what I mean. Also it would be great to have avatar on your profil page and be able to upload wallpaper. A bit like facebook,twitter,etc.. I have seen many user demand that feature so people will be very happy if you could build it, I definetely will be :) Again thanks for all you do. Wow, $205 bucks with just one vote. Great whale. Congrats! I love these surprise updates. Was a surprise to me too. I went through and wrote most of this post like 12 hours ago, having no idea when it was actually going to be released. I was just excited to have a feature I helped build go live. Then I noticed the 30 day trending in the dropdown and realized it was all live! I like crypto and my name is Barry. I'm so unoriginal. Lol. Hey @jesta so cool! Congrats and also a great add-on this follow/follower right here on Steemit! The very first one (following/followers) was my suggestion - See Here!. I am glad someone took notice and added that feature. Oh and it is a shame that they updated changes to the login screen killed the Password Manager function in Google Chrome....I have to manually enter Username and Password every time now.....can someone please take a look at that? @jesta this is awesome! My blog post yesterday was reaching out to my followers since I had no way of knowing who they were. Super glad to see this feature added. Not to be greedy but since you are now officially the resident expert on the subject, could you explain the follow API? Nothing I'm doing seems to work. I just want to see who's following me who I'm following and be notified whenever they do anything. I would upvote that all day long! Btw I'm following you. Awesome work! Are you looking for an API call example to get followers? I could probably write something up. 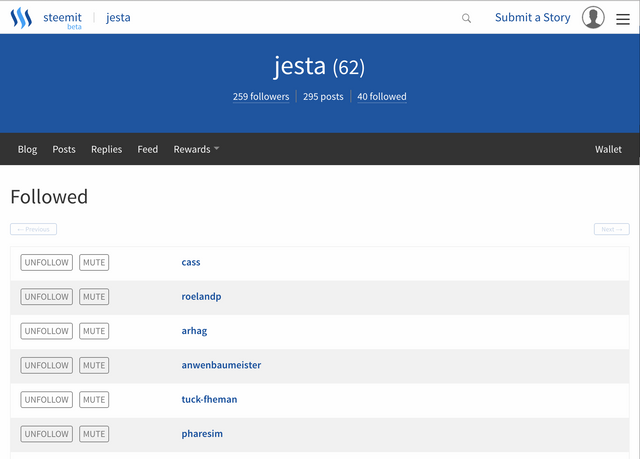 At it's core, it's get_followers('jesta', 0, 'blog', 100). But the actual syntax depends on what language you're using and what library you're using to make the calls. It needs to be called against the follow_api, which can be retrieved by calling get_api_by_name('follow_api'). @jesta Thank god for you sir! I think that may have been the piece I've been missing this whole time. I need to figure out how to map this to the JS api from SVK, but I do understand now. Can you explain the parameters you passed to get followers please? Great work, @jesta! Thanks for making the Steemit experience better for newbs like me! I am enjoying this app and the new way to see the trend of followers. This is good. I was waiting for this. Will we have profile picture next? Awesome! I know a lot of people have been looking forward to this feature. I just followed everyone back who follows me (which is what I try to do on every other social network). Many significant additions. Congratulations to everybody who contributed. And congratulations to you, @jesta , you did a great work. weigth slider that's visible for very large SP holding accounts. One more thing - there is a link to steemit.chat in the sidebar. From the comments I've seen on github, I believe it's accounts with greater than 100M Vest (which is like, 35k SP?). I admit that I forgot that the sidebar even exists :) Now I know! Thanks for additions of @jesta! Thanks for concern on community! The speed and scale od the development is admirable. You just feel it is a live project. I only noticed: "Pending Payout" to "Potential Payout"
And the voting button stays blue now, even after the payout. Wow, the final piece to the puzzle! awesome to hear. Very nice work! You beat me to the punch, I was in the middle of creating a Chrome extension to do just this =P Much better to see it on Steemit instead of an extension that needs to be downloaded! Congrats everyone! A lot of cool features. Great job! Love this feature keep up the great work. That goes for @jesta and all the rest of the developers keep up the great work from just a everyday user with little to no coding experience you guys are the ones that make steemit functional for the rest of us. Good observation, I have a good numbers of followers and I am following others too. "valzav and @jesta worked on adding a vote weigth slider that's visible for very large SP holding accounts. This will give them the option to choose how heavily weighted their vote is each time they vote." - Very welcomed addition I'm sure. Wow! This is all really great news! I follow everyone with a single button I mute everyone . Woah this is a great update! Thanks Jesta for pointing it out, also as a Side note I will no longer be following anyone who doesnt follow me, So if you would like a follow please hit my follow button :) Happy steeming everyone! Great update @jesta. Keep pushing the boundaries. We all appreciate your relentless dedication to making Steemit better. Very useful. Thanks for this! Hi @jesta. thank you for the news. I would like to know more about weight vote slider? Who will be able to have this option (min of SP etc)? 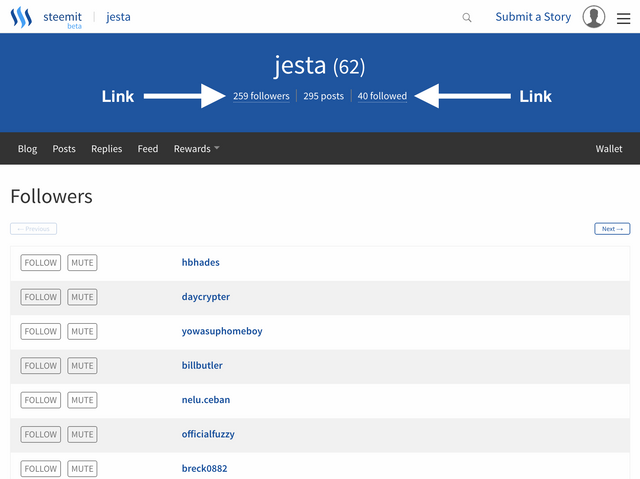 Thanks for adding your code to Steemit @jesta! Love the new update ​and especially the feature of being able to see my followers. New improvements make the process of navigation and information easier and more convenient. I love the rate of development of this platform. Just keeps getting better and more user friendly. This will make it more and more attractive to the wider community. That was you @jesta?? Hell yea!! I was dying for that feature. Awesome! Thank You. Imo "posts" should really be changed to "comments" as well. And I'm probably preaching to a giant choir here but a notification system would be great too. These updates are awesome! Thanks @jesta and all of the other devs. This platform just keeps getting better and better with every passing day! Thank you so much for the great work! I always wondered why you couldn't see who followed you and who you follow, but now that's laid to rest. Thanks again and keep up the good work! Awesome! It is great to see all the other updates that the developers are working on. Great job everyone! adding a vote weigth slider that's visible for very large SP holding accounts. Thank you for bringing this capability to life on steemit. I think a lot of us have been waiting for this! So handy if you want to reciprocate follow! Finally. It's done. Now I can see and use it. Thanks a lot. So can anybody write code to add such features - testing it out on the open-source code on a duplicate site - and then they submit the app/addition to the core Steemit team to be voted on for its implementation of the official site? Yeah, anyone can create their own "fork" of the code and develop features on it locally. Discussions happen on github about the features being developed on the forks, and once a feature is ready, a "pull request" is made to the original project. The maintainers of the original project can then choose to merge that code or ask for more revisions/fixes/changes. Once the code is merged, it's part of the original project, and then goes live the next time they update. cool. that is a great clarification. thank you! Very nice. I was missing that for sure. In fact this new era of transparency is something really revolutionary, we'll need a new born generation to grow up accustomed to it. Nice, steem gets better every day!